Please note: The Field of Dreams theme is no longer being distributed. If you are utilizing the field of dreams theme please ensure all footer links are removed as these are in direct violation of Google’s quality policies. If you need help removing these links please contact me. Field of Dreams is 2 column, widget ready, and completely free WordPress Theme provided exclusively by Not-So Boring Life. Back in March when I started Not-So Boring Life there was a lot of buzz how great designing a custom theme is for promoting your blog. I’ve spent the last 4 months designing, tweaking and optimizing this custom theme for public release and now it’s ready for prime time. The majority of the bugs should be worked out but if you happen to find any please post a comment describing your issue. Field of Dreams may be used free of charge for business, personal or non-profit WordPress Blogs. The theme or any variation thereof, including images, CSS, or links may not be duplicated or redistributed. 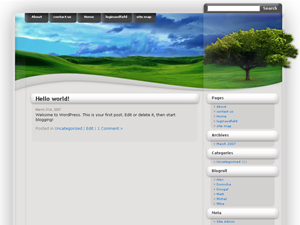 If you want the photoshop source file for this theme – email me. As with anything it’s not absolutely free. I want a link back. Perhaps this is a little easier than the $5 donation I was asking for. Additionally there is another very large benefit for dropping some link love my way, but I’m not posting it here, so EMAIL ME!